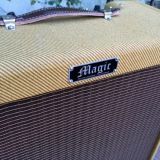 Categories: Amps, Just In, Magic Amps. 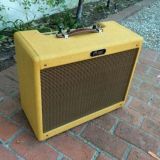 The Magic 5E3 Deluxe is a perfect replica of late 50s 5E3 Tweed Deluxe modeled after my favorite 1958 narrow panel Tweed Deluxe. 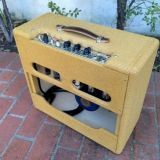 Deluxe cabinets are built using solid pine and finger joint construction with a durable amber tinted lacquer finish. Chrome plated steel replica chassis with added Standby switch in the "ground" position. Choice of transformers from Mercury Magnetics and Classictone. Speakers from Jensen, Weber, Eminence and Celestion. Tone capacitors by Sozo,Mallory and Jupiter. Sprague and F&T electrolytic capacitors. NOS Allen Bradley carbon composition resistors available for an addition charge. All NOS resistor values and wattages are identical to original 5E3 specs. 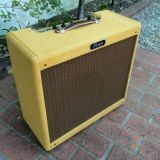 The standard 5E3 Deluxe can be run with either 6V6's or 5881 power tubes. 5881 power tubes require 5V4 or GZ34 rectifier.